There’s not a lot wrong with a stock Honda CB500X. It’s well built, economical, reliable, comfortable and a bit of a looker with its soft adventure styling. At £5,499 new it also represents great value for money. So, why on earth would you want to spend another £2,220 plus delivery on a modification kit and be faced with the task (or cost) of fitting it to a bike that’s hard to fault in showroom specification?The only answer that makes any sense is that your plans include regular off-road riding in conditions tougher than graded gravel and forest trails. There’s more in the detail (see Rally Raid Stage 3 Conversion box out) but in summary the Rally Raid Adventure Kit beefs up the front and back suspension, increases ground clearance and replaces the 17in cast wheels with more durable spoked versions at the front (19in) and rear (17in). But let’s be very clear here, even with the Rally Raid Adventure Kit fitted the Honda CB500X is no enduro or refined off-roader. Far from it. What you end up with is a bike that is still very comfortable for long distance road trips but is far better equipped, and more capable of taking on tougher trails, than the stock machine. In old fashioned terminology, a 500cc twin cylinder trail bike just about sums it up. Or, as I like to call it, a slow laner. 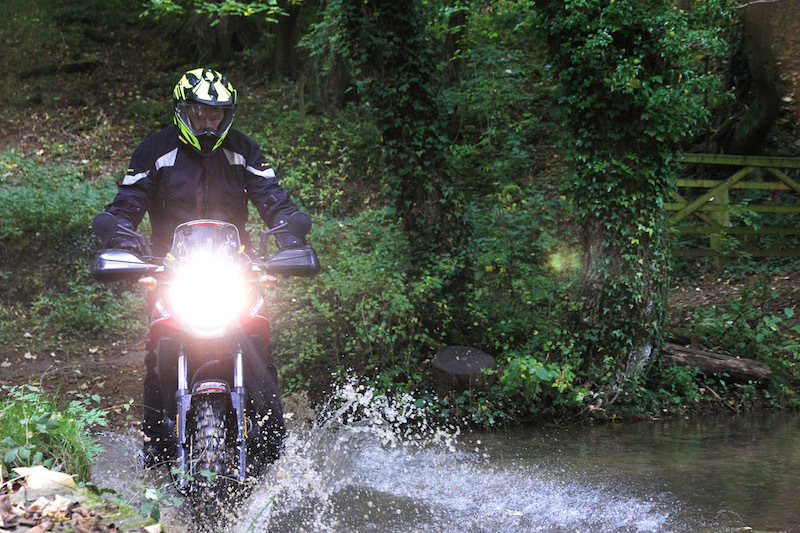 The cost of a new Honda CB500X with the Rally Raid Adventure upgrades comes in at £7,719. Then you need to add on postage and fitting if you’re not going to spanner it yourself. 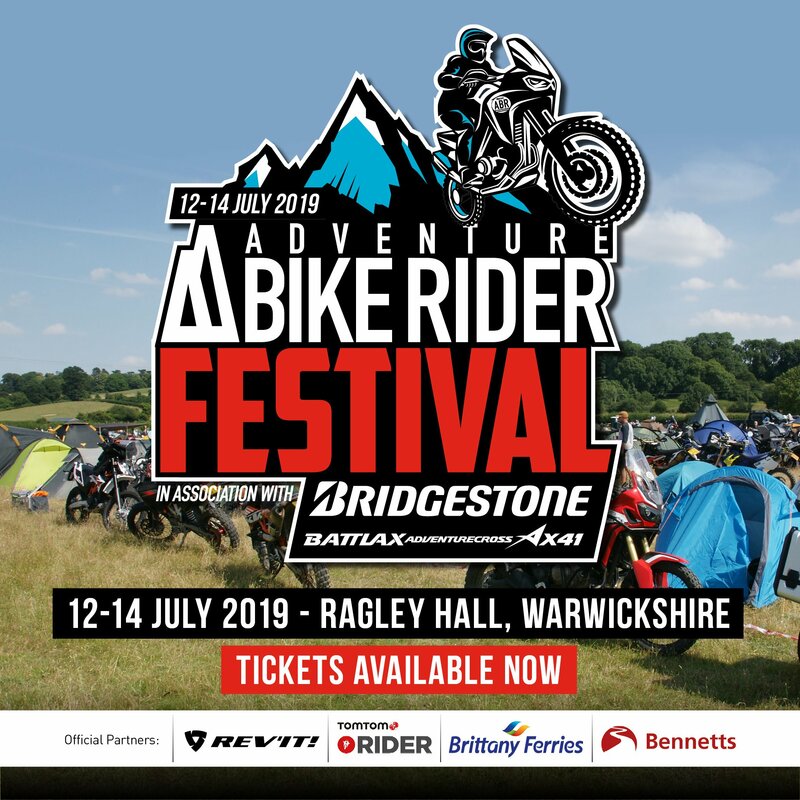 This positions the Rally Raid converted Honda at £720 more expensive that a new Yamaha XT660Z Ténéré or £1,220 more expensive than the often overlooked but very capable Yamaha XT660R at £6,499. Having personally owned a Ténéré for five years and taken an XT660R over 2,000 miles of gravel roads, desert and mud trails in Namibia I can confidently say that both Yamahas are capable trail bikes and, although they are big single cylinder thumpers, comfortable enough on long road trips, In short, they offer solid competition to a converted Honda CB500X. That said, the Ténéré is a very tall bike that carries its weight higher than the Honda. In experienced hands there’s not a lot that can stop it but it does need to be ridden with pace and confidence to get the best out of it. 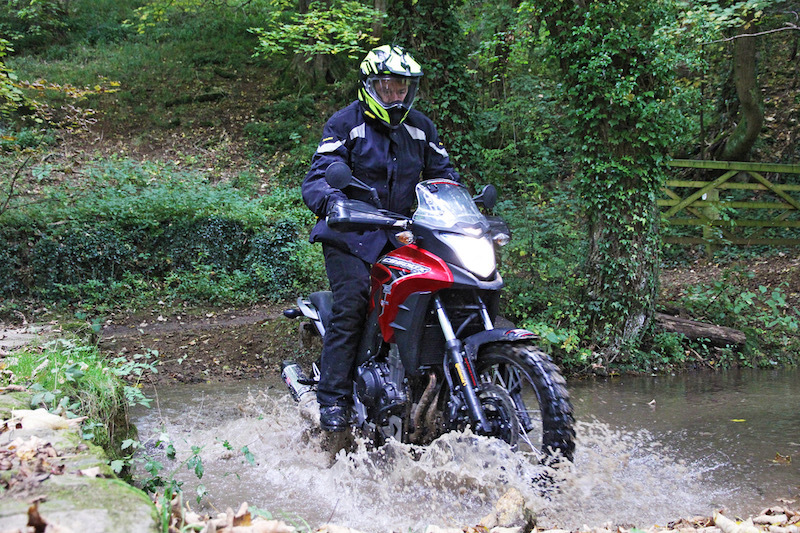 A less capable off-road rider can and probably will be intimidated by the height and characteristics of the Ténéré in anything other than very easy off-road situations. 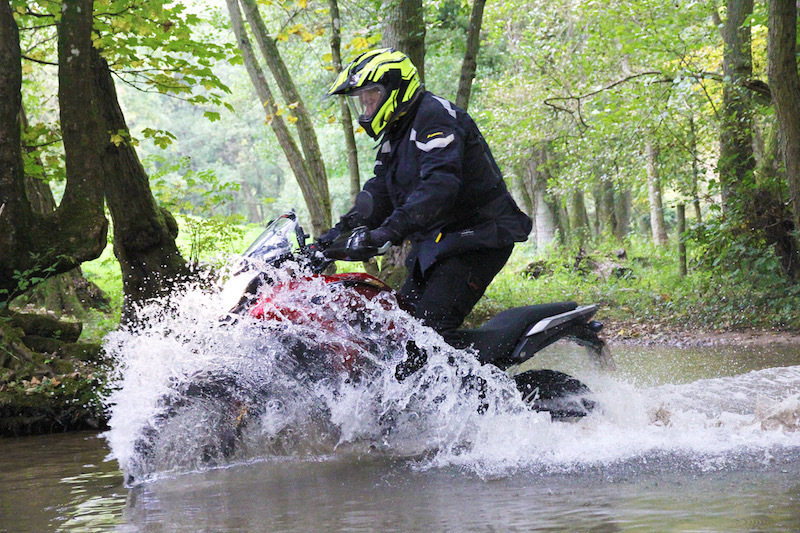 The XT660R is just as capable off-road and far less intimidating than the Ténéré. It comes with a lower 865mm seat height and is better balanced than its top heavy brother. 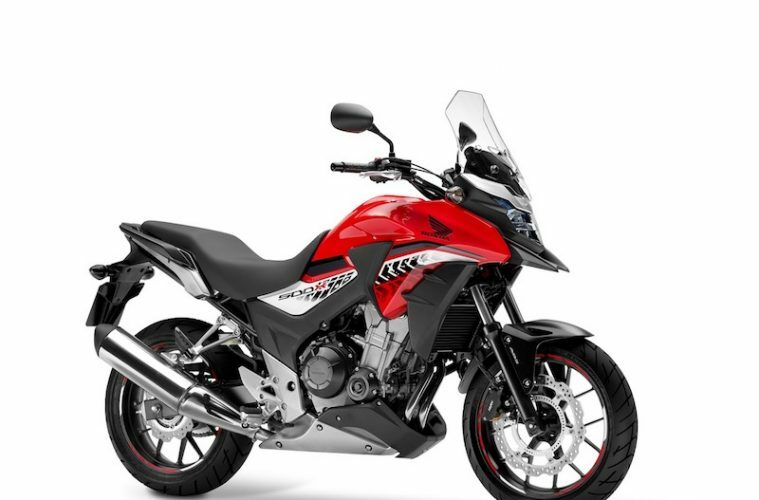 If the Rally Raid equipped Honda CB500X has a competitor then the XT660R is the bike. 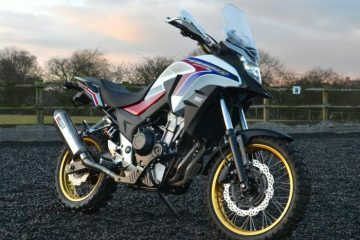 On first sight the Rally Raid CB certainly looks the part. The wire rimmed wheels shod in TKC80’s alter the soft adventure look of the stock CB into a much tougher looking recruit ready for front line action. The seat and riding stance are very comfortable though I felt the bars were still a little low for my 6ft 2in frame when stood on the pegs. There’s not a lot of technical spec to fill out a review on the CB; you get ABS and that’s about it. And that’s quite refreshing when I’m starting to wonder if I’d be better off reviewing modern software stacked motorcycles in a high-tec systems lab rather than out on the road. Heading off on a ride that would take me on sweeping country A roads, green lanes and a short section of motorway a couple of features that immediately impressed where the comfortable wide footpegs and the short stubby screen. On the low height setting there was absolutely no buffeting and it was just nice to be in clean, still air rather than the turbulence that some taller screens produce. By modern standards the engine feels very flat and lacks guts but then it’s been tuned to be A2 compliant. Even so, it’s a highly rewarding riding experience hustling the CB through the gears and working hard at building speed and momentum. You certainly get to use the whole rev range on this machine, something you’re unlikely to do on a larger and more powerful adventure or touring bike. I think the term is, it’s a fun bike to ride. The brakes are no more than adequate and the suspension I found to be on the soft side where hitting mid-corner bumps at speed produced enough wiggles to make the ride very engaging. When asked the question Rally Raid informed me that stiffer rated shocks are available at the point of purchase, I’ve no reason to doubt them. Turning off the tarmac and onto a green lane I immediately came across a section where the ruts on either side were over a foot deep and the crown between them was a very narrow strip of sloping, wet slippery mud. If I’d been on the Ténéré this would have been an occasion where I’d have just gritted my teeth, sucked in air and gone for it. If things had gone wrong on the Ténéré no way would I have been able to take a dab from the elevated seat without the top heavy Yamaha tipping over. On the lower, better balanced Honda there were no such worries and I just plodded along the narrow crest with confidence. This, in my mind, emphasises the main story with a Rally Raid equipped Honda. It’s just so easy to ride. The gentle power delivery, the low seat, reasonable weight coupled with a superbly balanced bike make for a confidence inspiring ride. It’s also a very comfortable and competent road bike. Add those two points together and few current machines at this size and weight match up. If you’re looking for a bike that’s capable of economical commuting, touring solo in comfort and beefed up for taking on the rougher stuff (at a gentle pace) then this could be your bike. Throw in the Honda reliability and extend your horizons and this is also a bike that’s looking ideally suited for longer adventure trips. Could I see myself riding down to Morocco in comfort and then attempting to reach the summit of the highest dune in Erg Chebbi aboard a Rally Raid equipped Honda CB500X? Yes I could and there’s not many bikes I could say that about. NB: Our test bike came fitted with a belly pan and Yoshimura exhaust both supplied by Rally Raid. – Long travel rear shock: Adjustable pre-load, damping and rebound – choice of three spring rates. – Front suspension: Internal replacements; longer springs, 30mm travel, adjustable pre-load, choice of three springs. – Triple clamp: 20mm stepped billet aluminium top clamp incorporating Scotts steering damper mounting, adjustable bar riser. – Extended side stand: The Rally Raid mods increase ground clearance by 2in and provide 7in of suspension travel front and back. The seat hight is increased to 870mm when fitted with TKC80 all terrain tyres. Engine: 471cc four stroke parallel twin, 6 speed. As a commuter: Economical, reliable and I’m struggling to think of a negative unless your commute involves a lot of motorway travel. As a weekend tourer: The long distance comfort on this bike is good and I’d be more than happy heading off to Wales or the Lake District for a weekend tour. The lack of easy power on motorways and fast A roads would be missed but more than compensated for when I decide to take on a few green lanes. As an off-roader: I think of the Rally Raid equipped Honda CB500X as a slow laner. Ride it fast and it quickly gets overwhelmed. However, for tootling along green lanes it’s a competent, non intimidating machine which in experienced hands will take on the gnarliest routes in the UK with ease. 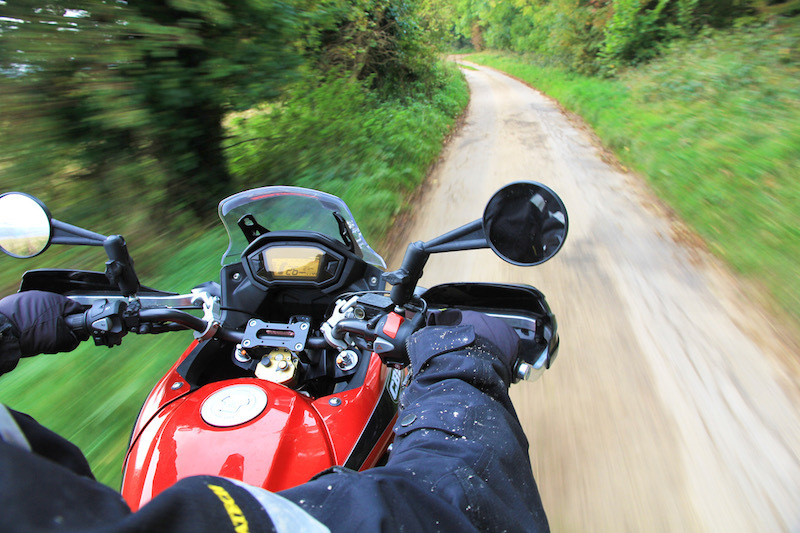 As a continental road tourer: I found the natural stress free cruising speed of the Honda CB500X to be around 65mph. Of course it’ll blast along all day at far faster speeds but it gets tiring after a while. It’s the sort of bike where you’ll want to take your time, conserve your energy and enjoy the view. And there’s nothing wrong with that. As a pillion carrier: The pillion seat is comfortable. That said, if a pillion is a regular fixture on your tours there are far better and more suitable bikes for two up trips. Round the world? Economical, reliable, excellent tank range, comfortable, reasonably light weight, luggage friendly and more than capable of taking on off road trails. The Rally Raid modified CB500X has the potential of becoming the cult bike of RTW motorcycle travellers. It would certainly be on my short list.